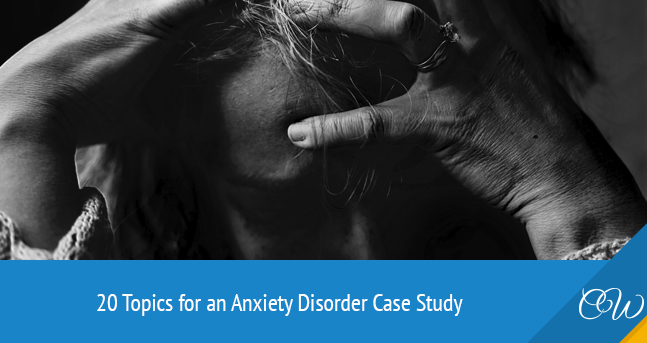 When a student has to write an anxiety disorder case study, he or she should not only find a proper case but also be aware of the topic and everything that concerns the matter. That’s why such academic assignment is quite difficult and challenging. A student has to choose a good topic and base it on some concrete case study. For example, one can write about post-traumatic stress disorder in general and then proceed to a particular case study. Here are 20 sample topics for a case study research. Many People Suffer from Insomnia. Do All of Them Have Anxiety Disorder or Do Sleeping Problems Signify Something Else? How not Acquire Anxiety Disorders When You Are a Lonely Woman about 35? When Is It Time to Worry: How to Recognize First Symptoms of Anxiety Disorder in Children and Adults? Can Hormonal Imbalance and Bad Immune System Cause an Anxiety Disorder Case? Can Physical Exercising Help a Person Get Rid of Anxiety Disorders? What Mobile Apps Can Help to Treat Anxiety Disorders? Do Animals Suffer Anxiety Disorders and Do They Become Dangerous because of That? Can a Person Suffer from Anxiety Disorders and Be Successful? Treating an Anxiety Disorder Case: Is It Possible to “Kill” Genetics and Give Birth to a Healthy Child? How to Manage Anxiety Disorders If You Live in the Third-World Country? What Are the Reasons for Social Anxiety Disorder and How Can People Fulfill Themselves when Having It? Why Do People with High IQ Often Suffer from Anxiety Disorders? Do Elite Athletes Risk Getting Anxiety Disorders after Their Failure or Retire? General investigation on the topic allows getting information about the issue, and concrete case study lets a person check the theory based on some examples. Mind to use appropriate facts to support each of these topics. Post-traumatic stress disorder occurs when people overcome some situation that had caused both mental and physical injury. Almost seventy percent of adults have experienced post-traumatic stress disorder in some way in the United States of America. That’s approximately 224 million people. Women are more likely to develop this particular disorder. The reason for PTSD can be different. Some people get into an automobile crash, a number of individuals survive after assaults committed by animals and people, some persons are injured at war and during military service, and some people overcome natural disasters. These reasons are considered to be serious ones. There are other events which can lead to PTSD. For example, a person can go for a walk and get scared by the sudden appearance of the barking dog. The dog cannot even touch a person but the person will be afraid of other dogs. Why? When a human being sees something unexpected one can either become paralyzed or think of possible outcomes of the situation. In the first case, shock awakes nightmares and recalls to negative information about dog’s bites which a person has heard of or seen somewhere. Due to that, this person may get PTSD that will follow his or her till the last breath. The object of the study is a man over 40 who used to be a military man. He became a disabled veteran and had to come back home. In addition to his traumas and after-war rehabilitation, he realized that he had acquired post-traumatic stress disorder. It’s a common problem of people who have been engaged in the military service. Military men follow certain rules and get commands. They are sure that their partner will protect his back and vice versa. Everybody trusts everyone there because that’s how they live and serve. When such people come back home, they realize that they cannot trust anybody. By the way, they have to deal with other serious problems. They don’t feel safe anywhere. Consequently, they try to isolate and avoid places inhabited by a great number of people. The vet (the object of the research) turned to have such problems as well. He had to rent a house in the wood far away from the town. He owned a 20-acre farm with lots of birds and geese which were his private guards. He didn’t trust anyone, including his own family. He woke up at night, took a rifle and went around his house to check if everything was alright. His family and friends thought that he would get over that. They couldn’t understand him and that was the main problem. He had only one friend who also was a disabled vet and who did really understand his state of mind. Soon, he started suffering from headaches, insomnia, muscle stiffness, paranoia, suicidal thoughts, and anxiety. His after-war life became his daily burden. In addition, he had a two-year-old son and a wife. He felt desperate because he didn’t know how to protect them. That’s why he decided to visit his physician. After some medical tests, he was diagnosed with post-traumatic stress disorder. He took some medicines (Clonazepam, Cogentin, Florinal, Levothyroxine, Haldol, and Chlorpromazine) to cope with headaches, insomnia, anxiety, and muscle spasms. He had also to visit his psychiatrist and communicate with other disabled veterans who had already treated or at least delayed the symptoms of PTSD. Such rehabilitation and course of medical treatment helped him to sleep better and feel less worried. He also managed to give up taking the drugs but it had not changed his attitude towards people (he still doesn’t trust them).